What’s that you see on your thinning oleanders? Is it the pesky pest Syntomeida epilais Walker, more commonly known as the oleander caterpillar? Or the spotted oleander caterpillar moth? If you live in Southwest Florida, you’re probably seeing an infestation of oleander caterpillars (no spots). If this critter with its stingless, bright-orange body and tufts of long black hair sets its sights on your oleanders, prepare yourself. It’ll be just a matter of days before you see complete defoliation. Still, no reason to despair. Even though these caterpillars will chomp away at the leaves, they’ll cause no long-term harm to the plant. The blemish is purely aesthetic. Yes, they may consume great numbers of leaves, but if your plants are healthy, new ones will sprout and no one ever know your oleanders had a problem. So why can’t birds just swoop down and snarf these guys up as delicious little snacks? Well, even though birds are often great predators of caterpillars, they won’t get near this pest due to its poisonous diet of oleander leaves. Your options? You can hope the oleander caterpillar’s natural enemies – stink bugs, wasps, and fire ants – will save the day, but a smarter choice would be to contact your professional landscape-maintenance company for other options to eliminate your infestation. 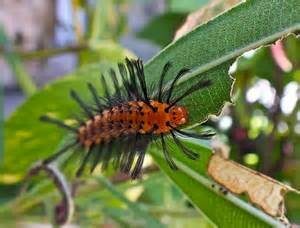 Just remember: a caterpillar’s meander on your oleander needs to be addressed quickly. More facts: Native to the Caribbean, the oleander caterpillar inhabits Florida year round until the cooler winter temperatures kill it off until the following spring. Its orange eggs are laid in clusters on the bottom of the oleander leaf. Once hatched, the caterpillar begins to feed on its host plant until it’s time to wrap itself in a silk cocoon and emerge as a polka-dot moth. The moth’s five-day lifespan is filled with finding a mate to start the whole process once again.